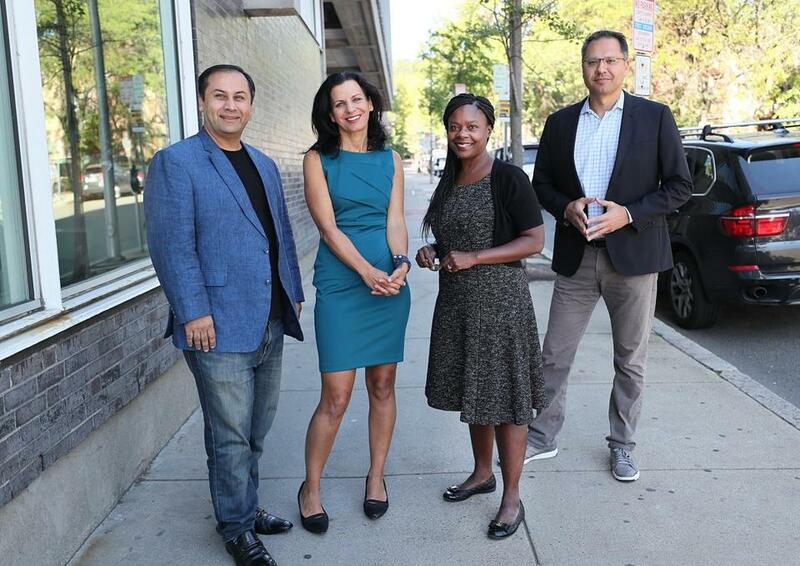 The executive team at Zemcar includes (left to right) Bilal Khan, founder; Juliette Kayyem, CEO; Donna Levin, a top adviser; and Shahid Azim, president. The homeland security expert and former gubernatorial candidate is a working mother of three, and she was all too familiar with the stress of coordinating transportation for after-school activities. Khan, a former Verizon executive, started Zemcar to help parents whose kids are too old for a nanny but too young to drive. With the ease of a smartphone app, parents can schedule rides with a driver, complete with a dashboard camera that sends a live video feed to mom and dad. Khan sought out Kayyem as an adviser, but as the Woburn startup shifted into high gear this fall, he had other plans: that Kayyem would replace him as CEO. Kayyem formally joins the company this week, with serial entrepreneur Shahid Azim as chief operating officer. The company has also appointed four new advisers, including Care.com cofounder Donna Levin and former Google executive Laura DeBonis. Khan, who remains involved as Zemcar’s chairman, said he always envisioned a woman at the helm, someone who understood firsthand the logistical nightmare of getting kids to and from soccer and baseball practices. He resisted hiring a CEO with a transportation background, though that might seem like Zemcar’s core business. Kayyem — better known these days for her recent memoir, “Security Mom” — served as a homeland security official in the Obama administration and as homeland security adviser to Governor Deval Patrick. After an unsuccessful run for governor in 2014, the Harvard Law grad and former Globe columnist started her own consulting firm and appears as an analyst on CNN. Safety is Zemcar’s competitive advantage against ride-hailing market leaders Uber and Lyft. The niche player boasts additional background checks beyond what the state requires, including face-to-face interviews for prospective drivers and a minimum driving history of five years. While Uber and Lyft prohibit children under age 18 from riding alone, Zemcar promotes itself as being the only ride service that carries insurance to cover unaccompanied minors. “The state standard is our floor, not our ceiling,” Kayyem saud. If this is starting to sound like “Uber for kids,” Khan and Kayyem prefer to think of Zemcar as being the “Care.com of transportation.” Just as Waltham-based Care.com provides an online marketplace for people to find caregivers, Zemcar helps customers figure out transportation options for those who need a little more hand-holding. “I was excited that Bilal was solving a pain point for parents,” said Levin, one of Care.com’s cofounders, explaining why she decided to become one of the company’s advisers. Unlike conventional ride-hailing services, Zemcar allows customers to choose their drivers and opt for door-to-door service to make sure kids get to where they are going. The company ferries children as young as 8 years old in Greater Boston. All this peace of mind comes at a price, and Zemcar is banking on parents being willing to pay a premium for it. The median price of a ride is about $31. Zemcar is among a new crop of app-based, family-centric ride services that are popping up, including HopSkipDrive and Zum in California and Sheprd in Boston. Carlo Ratti, professor of the practice of urban technologies and director of the MIT Senseable City Lab, said Zemcar’s focus on safety is similar to how ratings have been used to build brands online. Kayyem is new to the tech startup world, but the Democrat figured it was a good time to try something different.